Right off the mark, two things are good about MINIs. First, they’re already among the best sports cars on the road in terms of their ability to go fast, corner fast, and stop fast. Second, like other cars that are just plain fun to drive, MINIs have the uncanny ability to gather people together into clubs and organizations that have the sole intent of helping their members enjoy driving their cars. Combine these two factors, and you have a recipe for easy weekend fun: a good car to drive and a like-minded group of friends to drive it with. Our first recommendation is to get to know the car well so you’ll know how much fun it can be. Our second recommendation is to join a Mini club so you’ll have excuses to have fun with it as soon as possible. We’re even going to recommend that you not make any changes in the car immediately. Why spend money improving the car until you’ve got a benchmark to which you can compare it? With a clear memory of what your car was like before the improvement, when you do make changes in the car you’ll be the first to notice and appreciate the difference. 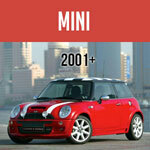 The MINI has been designed by enthusiasts with enthusiasts in mind. What we want to do is show you the difference between simply operating an automobile as a means of transportation, and driving a performance car for the sheer pleasure of it. But where should you start? We’re going to assume that when you first considered buying a MINI and visited the dealer, the sales rep spent a few minutes showing you the good features before you went out on a test driver, and told you more about how and why things are designed the way they are. We’re going to hope that you allowed a little time and curbed your enthusiasm when you first picked your car up to listen again as the rep talked you through the main controls and features. However, we’re going to bet you weren’t paying much attention. Sitting in your very own brand-new car is just too overwhelming an experience. So now that you’ve been driving your new MINI for at least a few days, what should you do? Start with the owner’s manual. We’ll bet that you’ve never read the owner’s manual from beginning to end for any car you’ve ever owned. Too bad. There’s a lot of information in those manuals so that from the beginning you’ll feel confident that you understand your car. The best way to do that is to take an afternoon in your driveway and sit in the car. As you read each section, look at the diagrams and compare them with the way things actually look in your car. Move, adjust, push, pull, try each of the levers and buttons. Don’t just look at the top of the oil dipstick, for example. Take it out and see what real oil looks like. Take the radiator fill cap off and look inside to see where the level should be. In other words, get to know the car thoroughly. Learn about it as if your life depended on knowing the car. Some dark night, it very well might. If you don’t have time to read the owner’s manual all the way through right now, then put it in the bathroom. Owner’s manuals are great reading material for those few minutes when you really don’t have anything else to do. Every time you have a chance, read a section, and then when you go out to your car the next time, try to remember what you just read and check out how it looks in real life. Another tip: when you’re driving your car, try to be as aware as possible about what it does and how it does it. Try to feel how the car moves and sounds when you accelerate, when you take your foot off the gas pedal, and when you put on the brakes. Try to feel what the car is doing when you turn a corner. Turn off your Ipod once in awhile and listen for the sounds of the engine as you accelerate and shift gears. Those feelings will be important as you start to plan how you want to improve your MINI and when you work on improving your driving. Once you’ve read the manual thoroughly, and become an expert on your own car (just try not to bore your MINI-less friends with your new-found knowledge and enthusiasm) and you’ve been around the block a few times with the car, it’s time to get serious about really learning to drive. First, we want you to go back to school. Yes, we know you’ve been through that driver training school before you got your license, and some of you might even have already had the experience of taking one of those state-administered driving schools that are offered with the first traffic ticket. Trust us; they didn’t even scratch the surface. When you were driving that little driving school car around your town, did you ever stomp on the brakes hard enough to make the anti-lock braking system kick in? Did you ever take a turn fast enough to make the tires squeal? Did you ever get the car to skid? Intentionally? If you haven’t done all of these things, you haven’t begun to learn to really drive. When you’ve had the chance to learn these things and practice them, the difference will be that when things do go wrong, you’ll be able to be a real driver, not just another potential crash dummy or organ donor behind the steering wheel. What we’re talking about is a real driving school, like professional race drivers take when they first start to learn to drive fast. We’re talking about taking the car out on a driving course or race track so you can find out what happens when something unexpected happens. We’re talking about learning what you should do when things do go wrong, so you can make them go right again. Lest you assume that you only need to go to an advanced driving school if you’re thinking about racing, let us be very clear. Participating in one of these schools will return every penny it costs and every minute it takes will make you a better, safer driver even if you never put a wheel on a track or autocross course again in your life. In several studies comparing high school students who have taken advanced driving courses to a random sample of those who didn’t, the rate of accidents was shown to be significantly reduced. Most insurance companies even give a discount to young drivers who have completed one of these schools. And if these penny-pinchers see the dollars and sense value of advanced driving schools, then you can make up your mind that value exists. There are lots of different opportunities to learn to drive better. Start by checking with your MINI dealer, since some of them sponsor MINI driving schools, or will be aware of courses in the local area. Check with the websites listed in the back of this book for driving schools sponsored by or in conjunction with the suppliers of aftermarket parts for the MINI. If there is a auto-racing track near you, check with them as well, since most race tracks host driving schools. The best situation is one where you can drive your own car in the course. One basic driving courses where you can use your own car is available at Thunderhill Park near Willows in north-central California (www.thunderhill.com). At least one driving course has been designed specifically for BMW MINI drivers, developed and presented by the Phil Wicks Driving Academy. Information is available at www.Minidriving.com. In this book, we’ll be passing on many of the tips that these courses offer their students, but nothing substitutes for the experience of taking a good driving course in your own MINI to put those tips into practice. Sure your MINI will be great for all the normal stuff, getting to work and out in the evenings, transporting you and your luggage on trips, or moving furniture, plants, or whatever else has to be moved from one place to another on the weekends. But there’s no substitute for just taking the car out on a weekend for the sheer pleasure of driving. If you can combine that with some friendly comaraderie, all the better. And there is where the MINI will excel. When Minis were first introduced in the sixties, their owners immediately recognized that they were a special group of people, able to appreciate the finer things in automobiling, and Mini clubs rapidly grew up all over the world. 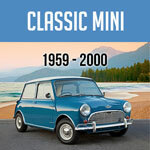 Those clubs remained active throughout the dark years when Minis weren’t even sold in the United States, and were a ready-made network of friendship and support when the new MINIs were first introduced. Recognizing the common appeal of old and new Minis, the club members were among the first to line up to try and buy the new MINIs, and the clubs welcomed the new owners with open arms. Today, any assembly of club members will still include a few of the old classics, but the majority of the members will be driving new MINIs. It’s easy to become one of those members. All clubs arrange frequent tours to allow members to get their cars out on the good roads in their areas, as well as organizing social and charitable activities around their cars. You’ll be surprised at how many activities are available. You’ll also probably be surprised at the wide range of backgrounds and interests represented by people who have been drawn together by the attraction of this new car. Membership in most of these clubs will span every age, from new drivers to old veterans, and their day jobs will cover every occupation and endeavor. In the appendix to this book, we’ve listed the contacts for as many of the clubs as we could find at press time. For current information, check with your local MINI dealer, who will know if there is a MINI club in your area, and it won’t take you long with an internet browser to find a current list of clubs. If you can’t find a local MINI club, maybe now is the time for you to start one. It won’t take much effort. Find a local restaurant or pizza parlor with a back room you can reserve, make up some flyers announcing a meeting in a month or so, then stick them on any MINIs you see. Offer to work with your MINI dealer to start a club. In no time, you can have your own local club. Understanding Car Car Codes and model designations.